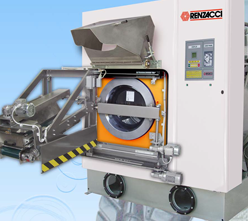 In more than 60 countries all over the world since more than 30 years the Renzacci sole degreasing machines have distinguished themselves by the great quality of the results together with the extremely reduced times to carry out the whole cycle, at lowest managing cost and with very easy operation and servicing, which enable them to work in the most difficult conditions. The Renzacci sole degreasing machines incorporate an exclusive technology which makes them PARTICULARLY APPRECIATED for the DEGREASING OF NOT ONLY POLYURETHANE SOLES OF THE MOST DIFFERENT SHAPES AND CONFORMATIONS, BUT ALSO OF THOSE MADE OF RUBBER, EVA, TR AND SO ON. All available technologies with loading modes in drum or loose. PD Plus SERIES:The most advanced series of sole degreasing machines using perchlorethylene solvent; many models are available so as to satisfy both the small niche productions and of large quantities. This series distinguishes itself by the almost total recovery of solvent with great advantages for the protection of the environment, the oerators' health in the working facility and the consumption of solvent. It offers many possibilities to personalize them, which make them extremely flexible. HYDROSOLE SERIES:The series using ecological isoparaffinic hydrocarbon- based solvents, unique in its kind and most advanced as to PERFORMANCE, ECONOMICAL MANAGEMENT, EASY MAINTENANCE AND RESPECT FOR THE ENVIRONMENT. The particular technology of the machines combined with the characteristics of the solvent gives many advantages, such as for example a major cleaning power accompanied by a lesser absorption of solvent by the soles preserving their natural characteristic of lightness. WATERJET SERIES:The advanced series of sole degreasing machines using water, featuring great performance and advanced multiple systems to purify the water from the soles detacher in order to improve the wash quality without having to resort to frequent processes to change and purfiy the water.